Emerald Ash Borer (EAB) is a metallic green beetle that feeds on ash tree species. The beetle originated from Asia and is thought to have been introduced to North America in the 1990's on solid wood packing material. In the U.S., EAB is a federally quarantined, invasive tree pest responsible for the death or decline of more than 100 million ash trees to date. EAB moves short distances (½ mile to 6 miles annually) by flying but can move longer distances in transit on ash nursery stock, ash logs, branches and firewood. What trees are susceptible to EAB? All sizes and even very healthy ash trees will be killed by EAB unless treated with an effective pesticide. Ash species attacked by emerald ash borer include green ( Fraxinus pennsylvanica ), white ( F. americana ), black ( F. nigra ), and blue ( F. quadrangulata ), as well as horticultural cultivars of these species such as ‘Autumn Purple’ ash. Ash trees, especially green and white ash, are popular shade trees in most Colorado communities. Ash trees are relatively fast growing and most varieties produce brilliant fall colors. How does EAB harm trees? Emerald ash borers experience complete metamorphosis, much like a butterfly. The adult life stage feeds exclusively on ash leaves. Adult beetles then lay tiny eggs on the bark of ash trees. These eggs develop into small larvae which bore into the trees vascular system. By consuming the tree's vascular system, the larvae disrupt the tree's ability to move nutrients and water, eventually starving the tree to death. Woodpeckers often remove bark from infested trees and feed on the larvae; the damage from woodpeckers can be severe and can often be seen from the ground. All untreated public ash trees will be removed. To ensure public safety. ash trees may be removed before exhibiting obvious signs of EAB infestation. Boulder Forestry’s long-term goal is to proactively address removal/replacement of untreated public ash trees (~4,500) to occur over next 7-8 years. Wherever possible, these ash trees will be replaced with a diverse mix of large maturing, non-ash tree species. Why do trees have to be removed now? Why can’t removal wait until the tree is dead? Ash trees dry out and become very brittle as they decline and quickly become a public safety hazard. In addition, a phased removal and aggressive planting schedule will allow the department to spread required staffing and financial resources over time. All ash will eventually die without pesticide treatment. EAB populations expand exponentially as does ash tree mortality. In Midwestern cities that have not used pesticides, all ash are dying in as short of a period of time as 10 to12 years after initial introduction. However by treating as few as 20 percent of a community’s ash trees, the overall EAB population is decreased enough that many ash are still alive after 10 years. How many trees have been treated for EAB in Boulder? 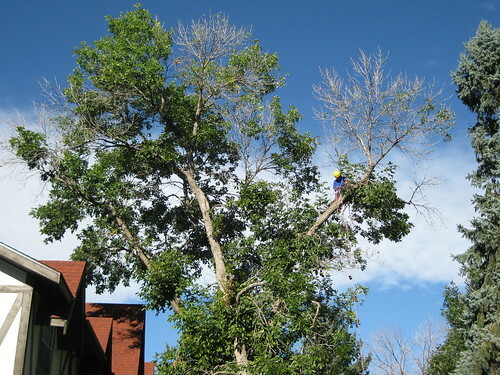 Approximately 1,300 public ash trees are included in Boulder’s EAB pesticide treatment program. These 1,300 trees are split into 3 groups and treated on a three-year rotation with an injectable formulation of 4 percent emamectin benzoate. Boulder began treating ash trees in spring 2014 with great success. Spread the loss of the urban tree canopy and the subsequent loss of the environmental, social, health and economic services provided by the urban tree canopy over a longer period of time. Adjacent property owners may be allowed to treat public street right-of-way trees with Boulder Forestry’s permission. The Animal and Plant Health Inspection Service (APHIS) rears the EAB biocontrols, a tiny, non-stinging parasitic wasp, at its Michigan facility and provides the biocontrols at no cost to Boulder. Local APHIS staff applied for the permits necessary to release four biocontrols in Boulder. The species include the larval parasitoids Tetrastichus planipennisi , Spathius agrili and Spathius galinae and the egg parasitoid, Oobius agrili . The two release sites for all four biocontrol wasp species are along Boulder Creek Path, on CU Boulder property near the CU East Campus, and the McClintock Trail area on Open Space and Mountain Parks property south of Chautauqua Park. Both locations were approved by APHIS through the permitting process. The biocontrol releases are a cooperative project including staff from Boulder Forestry, CU, APHIS and the Colorado Department of Agriculture. Who Should I Hire to Work on My Ash Tree? Only hire licensed tree care or landscape companies to perform work to their ash trees. If you choose to treat your tree, pesticide treatments must continue indefinitely to save the tree, which is costly and can have environmental impacts. Information about pesticide options for control of EAB can help inform you about some of the options available. If you are considering treating a tree in the public right-of-way, per ordinance, property owners must get preapproval from the city. Please fill out a quick online form to report EAB treatment of a public tree. Before hiring a commercial pesticide company, the Colorado Pesticide Applicators’ Act requires any person or company that applies pesticides for hire to be licensed as a commercial applicator through the Colorado Department of Agriculture (CDA) including companies applying only organic or natural control products. Licensing ensures commercial applicators have the necessary training, expertise and experience to apply chemicals to protect the environment and public safety. Every licensed commercial applicator in Colorado has to meet strict testing requirements that are enforced by the CDA. A person or company that performs applications of pesticides for hire without holding the appropriate license may receive a maximum fine of $1,000 per violation. CDA officials conduct routine office inspections to review records of applications, equipment maintenance and storage and disposal of pesticides in order determine that each pesticide applicator business is performing their work in accordance the pesticide use laws. The CDA also investigates pesticide use and application complaints. To file a complaint, contact CDA at 303-239-4151 . With additional questions or to determine if a pesticide company is licensed, call 303-239-4146 or visit www.colorado.gov/ag/dpi. Ash is a hardwood that can be transformed into art and useable products. Periodically, Boulder Forestry has the resources to mill small batches of urban lumber. This lumber is used for various internal projects as well as made available to the public at Resource Central. Proceeds from these lumber sales help support future milling efforts. Press releases are made ahead of each public lumber sale. Are You Treating a Public Ash Tree? Please note: The use of Neonicotinoid pesticides, such as Imidacloprid and Dinotefuran, are prohibited on public property in the City of Boulder. Common EAB products that contain Imidacloprid include “Bayer Advanced”, “Merit”, and “Safari”. These products should not be used to protect public ash trees.